I knew that someone would eventually write a column like Bob Herbert's "The Chess Master" (The New York Times, February 9), presenting Barack Obama's rational political strategy as equivalent to brilliant chessplaying. Not surprisingly, Herbert is not the first to make the comparison: "Chessmaster Obama's Plan for a 60-Seat Super-Majority" is only one of many that I turn up with a quick Google search. It seems that there is a new game in town, and one that contrasts sharply with the primitive, bullying, dangerous, risk-taking, and self-centered gamesmanship of the previous administration, as I have commented on in "Texas Hold'em," "Chess and Diplomacy" and "US-Russian Diplomacy as Monopoly vs. Chess." I hope Obama's middlegame and endgame are as strong as his opening. Obama played chess as a kid. I scribbled out my take on the subject. In my opinion, Obama is one of the 5 smartest presidents ever. (I'll also take Madison, Jefferson, JQ Adams, Kennedy.) 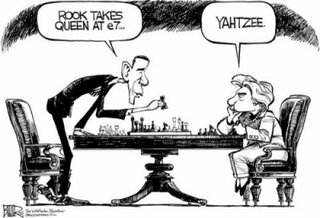 However, i think the country is in much worse shape than the govt or media would dare let on, so if Obama is a chess master he will have to play at knight odds. Great stuff. Last night during the press conference I was astounded by the contrast. This guy actually likes thinking things through, likes to wrap his mind around details, filter through multiple information sources, and even thinks about the broader philosophical themes he is encroaching upon. I got chills. And today, an Iranian official said that "chess is a better game than boxing" when it comes to US - Iranian relations. Or does the US play checkers while Russia plays chess?